It has been more then a decade since a player from the Big Ten took home the Heisman Trophy. In 2006, Ohio State quarterback Troy Smith took home the award. Since then, the trophy has gone to five players from the SEC, three from the Big 12, two from the ACC and one from the Pac-12. Could 2018 be the year a player from the Big Ten snaps that streak? Six Big Ten players showed up in Bovada’s most recent listing of Heisman Trophy odds including three quarterbacks, two running backs and a defensive end. A running back is the conference favorite heading into the season, but it’s worth noting that a quarterback has taken home the award 10 out of the last 12 years. Taylor opens up as the Big Ten’s best bet to take home the trophy according to the odds. At +900, he trails only Stanford running back Bryce Love (+700) and Alabama quarterback Tua Tagovailoa (+750) nationally. 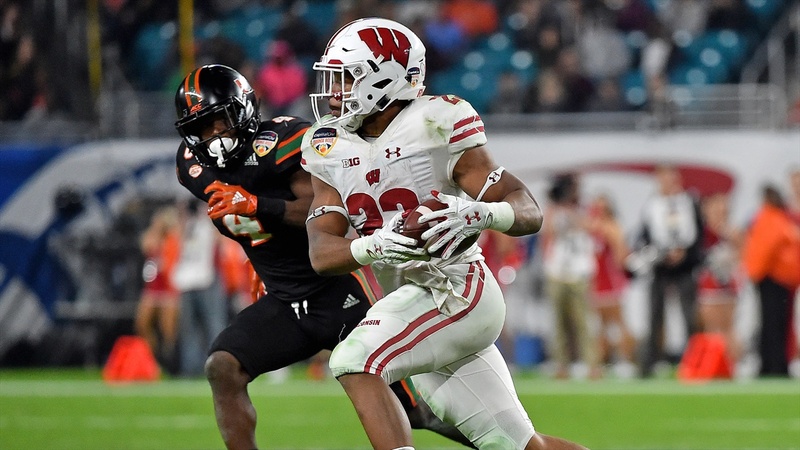 Taylor had a phenomenal freshman year for the Badgers, totaling nearly 2,000 yards on the ground behind Wisconsin’s monstrous offensive line. The Badgers will open the season at No. 4 in the AP poll after receiving one first place vote in the preseason poll released on Monday, and if Wisconsin can live up to those expectations and challenge for the Big Ten title and a spot in the College Football Playoff, Taylor’s name will certainly be in the Heisman discussion. With top returning receiver Quintet Cephus stepping away from the team, Taylor will be counted on even more. His biggest negative at this point (outside of not being a quarterback) is that he’s not much of a pass catcher. If he can grow into a receiving threat as a sophomore, he’ll have a chance to post even gaudier yardage totals which always look good on a Heisman resume. Haskins is one of three Buckeyes on this list, which speaks to the talent Urban Meyer has assembled in Columbus but also might make it more difficult for any one of them to stand out enough individually to garner enough first place votes. After seeing most of his time in mop-up duty behind JT Barrett last season, Haskins performed well enough in spring ball to inspire a transfer from Joe Burrow, the other candidate to succeed Barrett at quarterback, and the team is now his. Ohio State came in one spot behind Wisconsin in the AP Preseason Poll at No. 5, so expectations are high for the Buckeyes despite Meyer’s uncertain status. Haskins isn’t quite the runner that Barrett was, but he is also a better pure passer and was incredibly efficient in his opportunities as a freshman. If the sophomore can translate his freshman production into a full-time role, he has a chance to post some gaudy numbers and attract the attention of voters. However, being the guy defense game plan for is very different then coming off the bench in blowouts and Haskins is still just a sophomore with 57 career pass attempts. McSorley is the only senior on this last and was the most productive quarterback in the Big Ten last season. A talented passer, McSorley is also dangerous with his legs in the red zone and on third down. He totaled 39 touchdowns last season, second only to Barrett in the Big Ten last season. Penn State opened at No. 10 in the preseason AP Poll but lost quite a bit from last year’s 11-2 team including McSorley’s top three playmakers — running back Saquon Barkley, wide receiver DaeSean Hamilton and tight end Mike Gesicki. Can Penn State replace those weapons well enough to live up to expectations and give McSorley enough help to post the stat totals he’ll need to be a Heisman contender? Time will tell, but either way he’s going to have to step up his play even more. Jonathan Taylor wasn’t the only spectacular freshman running back in the Big Ten last season. Dobbins put up some big numbers last year two and immediately jumped some talented players on the depth chart when he arrived in Columbus. That being said, Ohio State still does have other mouths to feed in that backfield, namely junior power back Mike Weber, and that might make it tough for Dobbins to post Heisman-worthy statistics. Last season, Weber carried the ball about eight-and-a-half times per game and totaled 10 touchdowns. It’s going to be tough for Dobbins to outshine Taylor considering their respective roles, and Dobbins also has to beat out his own teammate in Haskins, who opened with better odds despite his lack of experience. In perhaps the least surprising bit of news to come out of Big Ten fall camps, Michigan named Patterson its starting quarterback on Monday. Patterson was granted immediately eligibility earlier in the offseason after transferring from Mississippi and beat out a returning starter in Brandon Peters among others. Patterson put up some gaudy yardage totals in seven games as the starter at Ole Miss last season before seeing his sophomore season cut short by a leg injury. Now fully recovered, could he be the solution at quarterback Jim Harbaugh has been looking for ever since he arrived in Ann Arbor? Michigan was tabbed 14th in the preseason AP Poll and boasts what should be one of the nastiest defenses in college football next season. That defense should keep the Wolverines in every game all season, and if Patterson can fit into Harbaugh’s offense and make the right plays, Michigan could be scary. However, he’s going to have to cut down on the turnovers; nine interceptions in seven games is not going to cut it. Bringing up the rear is the only defensive player from the Big Ten to make the list and it is the third Buckeye: pass-rushing monster Nick Bosa. The younger brother of Los Angeles Chargers Pro Bowl defensive end Joey Bosa, Nick was part of a rotation for one of the deepest defensive lines in the country and still posted 8.5 sacks. Now, with a few of those other linemen off to the NFL, Bosa should have a more featured role for the Ohio State defense in 2018. He is an incredible pass rusher who wreaks havoc in opposing backfields and should put up some monster tackles-for-loss totals this season. However, Bosa will be competing with both his quarterback in Haskins and his running back in Dobbins for votes if Ohio State puts together a terrific season, and after Ndamukong Suh finished fourth in Heisman voting in 2009, it’s difficult seeing any defensive player win the award. Bosa has the same odds to win the award as Houston defensive lineman Ed Oliver, who many feel is the best player in college football. The Heisman has become a quarterback-driven award in recent years and Michigan State’s Lewerke is one of the better returning quarterbacks in the Big Ten. If the Spartans can build off of last year’s 10-3 campaign and knock off some of the other top Big Ten teams with Heisman contenders (like Penn State, Michigan and Ohio State) Lewerke could break out on the national stage. Lewerke is a solid dual-threat quarterback whose legs make him tough to contain, but he’s going to have to improve his passing in 2018 to have a better season than the likes of McSorley, Haskins and Patterson.